On April 3rd, 1855, a public meeting was held at the Court House, Warwick, to discuss a proposal for establishing a Reformatory School to serve the county of Warwickshire. The meeting was attended by eminent figures including the High Sheriff, magistrates, members of parliament and the nobility, including Lord Leigh, the scheme's leading proponent and financial contributor. A committee was formed to manage the project and to raise subscriptions to fund the construction of its premises, which would admit boys between the ages of eight and fourteen who otherwise would have been liable to imprisonment. Initially, it was proposed to approach the management of the Saltley Reformatory with a view to extending its premises for use by the county. However, it was eventually decided that the location of the Saltley establishment was unsuitable and an alternative site of thirty acres was found on a farm belonging to Lord Leigh at Weston under Wetherley, near Leamington Spa. The existing buildings were extended according to plans designed by the county surveyor, Mr Hill. The premises then comprised a master's house and offices, with a building containing the boys' schoolroom/chapel and dormitories joined to the master's accommodation by cells, lavatory etc. The foundation stone for the new buildings was officially laid by Lady Leigh on March 26th, 1856. The institution was granted its certificate of operation on November 20, 1856, initially accommodating 40 boys. In 1859, additions to the building increased its capacity by 30 places. In addition to classroom lessons, the boys were mainly occupied on agricultural work on the 24 acres of land attached to the School. The School site is shown on the 1905 map below. Warwickshire Reformatory for Boys site, Leamington Spa, c.1905. In 1869, it was noted that "Lord Leigh's interest in the school has enabled 12 of the boys to emigrate during the year." The School's first master and matron were James and Harriet Shaddock. In around 1876, The Shaddocks' son, Edwin, and his wife, Alice, became assistant master and matron. In around 1877, perhaps due to Harriet's ill-health, her daughter, also called Harriet, took over as matron. Harriet (senior) died in 1880, Alice being appointed as matron the following year. After James Shaddock's sudden death on April 13th, 1883, William Pengelly (or Pengelley) and his wife, Henriette, were given charge of the establishment. On the evening of Sunday, September 3rd, 1886, a large-scale break-out occurred at School. The escape, which was pre-planned, was orchestrated by an inmate named Brooks, from Leamington. After evening service, another boy, who looked after the institution's double gates, opened them to allow a hospital patient to pass through. While the gates were open, about 40 of the 73 inmates rushed out, including the gatekeeper. An alarm was raised, and several of the boys were immediately recaptured hut the remainder escaped. They made their way towards Coventry, where they were first noticed at 11.15 p.m. by Police Constable Skelcher, nearly all armed with sticks and slings and stones. PC Skelcher followed them at a distance but was spotted by the gang who attacked him with stones and sticks. The mob moved on to Poddycroft Gardens, where they caused extensive damage, and were soon surrounded by a posse of police who made nine arrests. A violent affray ensued, with injuries on both sides, and more of the boys being taken into custody. Later in the night, Police Sergeant Walton, encountered four of the boys who were armed with sticks. He was attacked and injured, but managed to captured one of them. The other three ran away and were later found to have barricaded themselves in an outhouse at West Orchard. Sixteen boys were eventually held in the police cells. Ten other boys were arrested at Bedworth. Sergeant Walton's chief assailant, 18-year-old Joseph Bird, was charged with assaulting the officer in the execution of his duty, and the others with absconding from the reformatory. Bird was committed to gaol for two mouths with hard labour. The others that had been detained were: George Underwood, aged 17¾, who had been committed from Birmingham; James Wincott, Leamington; Richard Moore, 18, Birmingham; George Parsons, 17¼, Birmingham; William Beynon, 18, Birmingham; William Clayton, alias Brown, 17¾, Birmingham; Charles Bloxham, 17, Leamington; Henry Hemmings, 17½, Aston; John Nicholls, 17, Aston; Alfred Aston, 17, Birmingham; George Ravenhill, 16, Aston; Tom Bray, 16, Coventry; James Henry White, 14, Birmingham; William Magson, 14, Coventry. In reply to the Bench, the prisoners said they had no complaint to make against the manager, and they had always plenty to eat. Moore and Underwood said they escaped because they had been wrongfully accused of misbehaviour. Mr. Pengelly denied this statement, and added that the prisoners had been brought to book on account of misbehaviour in the dining-room, but they had never been punished without good cause. Moore and Underwood were sentenced to three mouths' hard labour, and the other three to two months each. The terms of imprisonment were added to the boys' Reformatory sentences. In 1892, there were six boys working in the tailor's shop, four in the tailor's shop, and four in the carpenter's shop. The vegetables produced in the School's garden resulted in a large business being carried out in Leamington market. A good business was also done in firewood. Mr Pengelly, an accomplished musician and vocalist, instructed the boys in singing. They performed well and formed the choir in the local parish church. 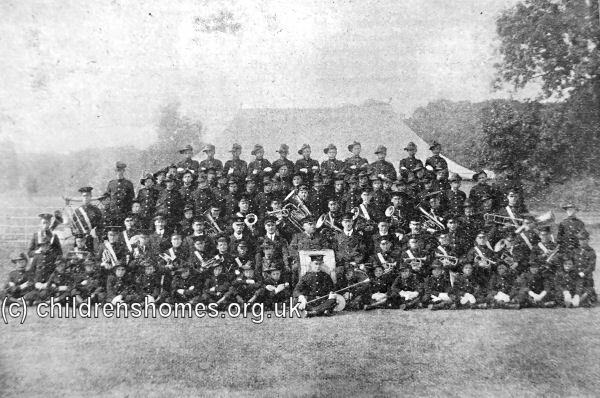 The School also had a brass band which led some of it members to a career as army bandsmen. In addition to master and matron, the staff in 1892 comprised the schoolmaster (Mr Whitwell), bandmaster, tailor, shoemaker, carpenter, two labour-masters, gardener, herdsman, waggoner and van man, and two house servants. In 1904, the death was recorded of Mr Walter, who had served as the School's carpenter for 46 years. He was succeeded by Mr Shettle. At the same date, The Pengellys' son, Edgar, had become the School's head schoolmaster and gymnastic instructor. In 1909, Edgar was appointed assistant superintendent. In 1903-4, a new 32-bed dormitory was built on top of the old tailor's shop and carpenter's stores. A new carpenter's shop was built outside, the old carpenter's shop converted to a tailor's shop, and the old shoe shop into a boys' wardrobe. In March 1904, the official capacity of the School was raised to 100 boys, and raised again in April, 1909, to 105. The number was reduced in July, 1924, to 90. From around 1910, the Reformatory adopted the title of the Weston Training School for Boys, often shortened to just Weston School. In July, 1914, a party of 24 musicians from the School were driving in a two-horsed charabanc to Hatton Asylum when they were in collision with a motor car at a crossroads. Several of the boys were injured, with the driver of the car being subsequently convicted of dangerous driving and fined £10. The School closed in 1928. The following year, the site became Weston Hospital (or Weston Colony) for 'mentally defective' patients. The surviving buildings have now been converted to residential use. Warwickshire County Record Office, Priory Park, Cape Road, Warwick CV34 4JS. Has a few administrative documents relating to the Reformatory, and the records of Weston Hospital (closed for 100 years).